Want to learn more about organic/sustainable farming/gardening? We have internships available March-December. What can you learn during your stay here? You will learn hands on what goes into putting food on the table from the soil up. We have been market gardners for over thirty years and have a wealth of knowlege to share with you. To extend your learning experience we have an on farm library and network with a number of farms within our region for farm tours and other learning opportunities. Our interns tent it here on the farm; your choice of space in our seven acres of riparian area or closer in to the house. They share our bathroom, kitchen, and laundry facilities. 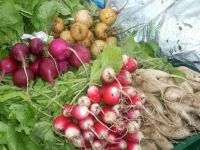 We provide fresh in season produce from the farm and a small stipend to help cover additional food expences. No experience is needed; just a passion for learning. We ask for a six week commitment; the longer you stay, the more you can learn. Work shares available. Our work share folks need to commit to 5 hours of work per week. They will receive an full share of produce, even sometimes more in exchange! Volunteers are also welcome to come join our food growing adventures! !